The mouth salivates at the thought of a beautiful Belgian waffle for breakfast. Topped with all sorts of goodies from fruits to nuts to enhance the experience, I can think of few breakfast foods that elicit such paroxysms of delight. In years past, the most common means of making waffles was a heavy, solid cast iron appliance that you placed over a gas burner on your stove. You had little control over temperature, so each waffle emerged from the grids as a little different product. Those older appliances still exist, but newer, electric appliances have emerged in the marketplace and they make waffle making so much easier. Oster, a much respected and long-lived manufacturer in the food processing industry, offers a totally modern electric appliance that takes most of the guesswork out of making waffles. Small and easy to use, this waffle maker will make your waffle-making seem like a dream compared to what your grandmother had to do it. This particular Belgian waffle maker has an adjustable temperature control dial that gives you more control of the heat than a simple high, medium, or low setting, and certainly more than a stove top setting. Whether you like your waffles crispy or fluffy, you’ll be able to find just the right temperature setting that works for you. In addition, the red and green indicator lights tell you when the waffle maker is on and when it’s ready to bake. Although the waffles you get from this little machine are not as thick as from some models, they have large pockets with enough volume to fill with all sorts of delicious toppings. This waffle maker is for anyone who enjoys the taste of freshly made waffles without a lot of fuss or having to go to a restaurant. Simple, and easy to use, you don’t have to be a trained chef to produce delicious waffles. The controls are very simple. Open the box and you’ll find the waffle maker appliance as well as the removable upper and lower plates. The manufacturer has also included an instruction manual in English, Spanish and French that explains how to use the machine and clean it. It also includes recipes. Lightweight at only 3.3 pounds, this little appliance (10 x 4 x 8) takes up little counter or cabinet space while in storage between waffle-making sessions. You can also store it vertically in any cabinet. Because of its small size, you should have no problem finding a place on your counter for it to sit while you make waffles. The stainless steel housing makes is very durable and attractive. The nonstick 8-inch waffle plates will make a waffle of about 7½”. And after you finish making waffles, they are removable for easy cleaning. And you can grip the cool-touch handles without fear of burning yourself. All in all, the Oster Belgian Waffle Maker is a compact little appliance that does exactly what it says it will. It’s at a good price point with some waffle makers less expensive and several that are more expensive. The particular product is a good choice if you want to make waffles on a regular basis. This particular Oster model is very easy to use. Mix up the batter from your favorite recipe. Plug the waffle maker in. When the little green light comes on, pour some batter onto the lower plate. Close the lid and wait about 4½ minutes. When no more steam rises from the maker, your waffle is ready to eat. Remove with a plastic or silicone utensil and serve. For a complete tutorial, have a look at this video below. You’ll see just how easy it is. The only downside of this product that I could find was that it didn’t have a timer or other indicator to let you know when your waffle is cooked. You’ll have to use an independent timer. Other products, including the Cuisinart Double Belgian Waffle Maker, and the Presto Flipside Belgian Waffle Maker are among those that either have an indicator or time built into the appliance. However, they are more expensive. I’d be willing to use the timer on my stove or microwave to save a few dollars. I like this product very much for its ease of use and ease of cleaning. Simplicity itself, anyone can use this little appliance from the beginner to the more experienced chef. Apparently, people who bought this waffle maker liked it too and their reviews on eCommerce sites reflect this. So, get rid the usual breakfasts. Don’t go out just to get waffles. Make your own, quickly and without muss or fuss. Everyone will thank you for it. The positive reviews about the Oster Belgian is worth giving it a try. Getting another waffle maker won’t be a bad idea for a waffle lover. Sure. 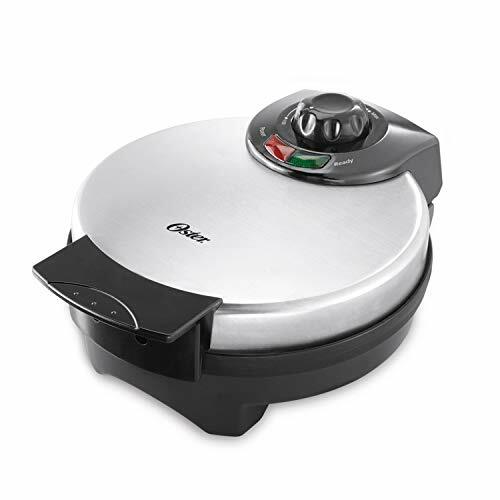 Oster Belgian waffle maker is really a good waffle maker and you will enjoy it. Since the controls are easy to walk-through, then I think it is easy for anyone to operate the Oster Belgian waffle maker. Ya, the Oster Belgian waffle maker controls are pretty forward. The aesthetic appearance is actually great, and since you also said it is durable, then I think it is worth recommending to my sister. Wouldn’t be a bad idea. I have heard so much about Oster, though I never used any of their products. A friend told me about the Oster waffle maker recently and I’ve been looking read something about it, so far, nothing negative. I think I will go for it. Plus, the price is fair. Thanks for the review. I’m glad the review was useful. The Oster Belgian waffle maker is certainly not a bad pick.